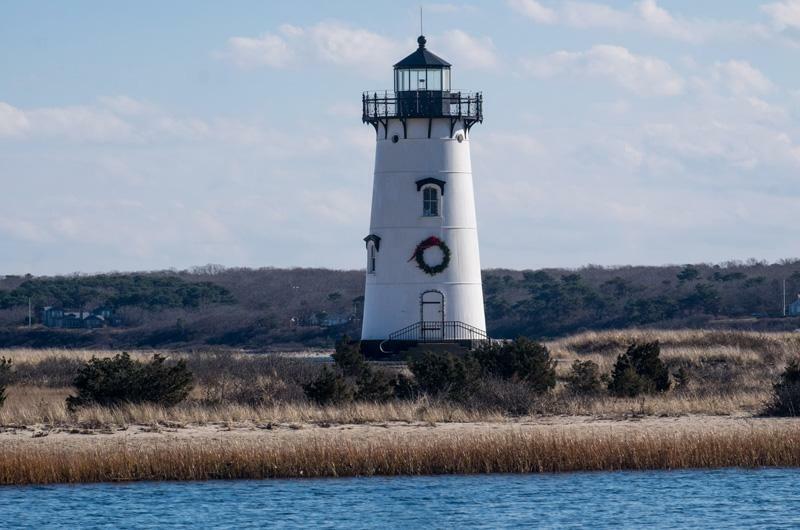 Lighting of the lighthouse is a favorite tradition and will take place as usual this year, but with the Harbor View Hotel closed for renovations, viewing will be from Memorial Wharf. Ready to stuff stockings instead of turkeys, Edgartown has begun to prepare for the annual Christmas in Edgartown weekend. The popular event this year takes place from Dec. 6 through Dec. 9, offering residents and nonresidents alike special shopping deals, holiday brunches, Christmas carols and 5Ks. A highlight of the weekend is always the illumination of the Edgartown Lighthouse. That event will take place as usual this year, but there will be no viewing from the cozy quarters of the Harbor View Hotel, which is closed for a winter-long renovation. As a result, many of the Christmas activities, including the lighting, will be relocated to Memorial Wharf. Before the lighting occurs at 6 p.m. on Friday, Dec. 7, Ms. Ready has organized a vintage Volkswagen photobus for people to take pictures with Santa, who plans to float into Edgartown on the Chappy ferry. There will also be face painting, as well as hot cocoa and snack sales from a local nonprofit. Other highlights from the nearly 100 events throughout the long weekend include the Christmas parade, which starts at 11 a.m. on Saturday morning at the Edgartown School and goes up Main street before winding around Winter street and Pease’s Point Way. Later in the day, celebrants can take part in the Teddy Bear suite, newly located downtown at 17 Winter street in Nevin Square. And on Sunday, those who want to make room for a hearty brunch can run off the Saturday night calories in the Teddy Bear Trot, a 5K run or walk that starts at the Kelley House and benefits the Boys and Girls Club of Martha’s Vineyard. Overall, the weekend is expected to bring in some $50,000 for Island charities and the board of trade. For those who are off-Island, 2018 will be the first year that both the Hy-Line and the SeaStreak will be offering round-trip ferry service to Edgartown. The Hy-Line will run from Dec. 7 through Dec. 9, providing service from Hyannis to Edgartown, while the SeaStreak plans to offer two trips a day from Dec. 6 to Dec. 9, leaving out of New Bedford. More detailed schedules are available on the on the websites for the ferry companies. A complete list of events is available on the Edgartown Board of Trade website. Christmas Eve and Christmas Day religious services around the Island.